KISTERS offers professional 3D CAD viewers for easy and efficient visualization of 3D CAD models, office documents, scans, and drawings. Select from enterprise viewers (Catia Viewer, NX Viewer, JT Viewer). In addition 2D viewers are beneficial for MS Office (DOCX viewer, XLSX viewer), technical drawings (DWG viewer, DGN viewer), and image file formats (TIFF viewer, JPEG viewer). In addition to the client-based 3DViewStation Desktop the HTML5 web-based solution 3D ViewStation WebViewersupports Catia, Creo/ProE, NX, SolidWorks, SolidEdge, Inventor, JT, STEP, IGES and other file formats. Easily integrate it into any web solution, product configuration solutions, service applications, cloud solutions, and portals to access a large number of useful functions. Discover the best fitting solution for 3D visualization, document sharing, analysis, technical documentation, and publishing. Leverage our expertise for your success. 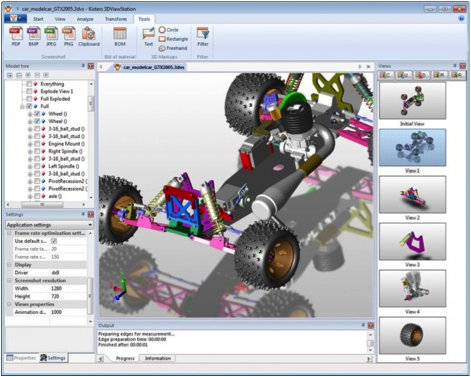 Customized 3D CAD viewing software optimizes re-utilization of existing designs or models within the value chain. More than 3,000 customers with more than 150,000 installations make KISTERS a sought-after partner for visualization solutions, professional competence, and best-in-class customer support. 3DViewStation comes in 9 language versions. Licensing: workstation-based or floating (optional). Engineers and designers rank the intuitive UI as one of the best. The modern UI and ribbon framework provide great convenience, especially when handling extremely large assemblies and enhanced analyses. Users can define shortcut keys and add a quick access toolbar. Beyond measurement and slicing, access a 3D comparison function and true MultiCAD digital mockup (DMU) processes. Manage geometries on the tile system or via proprietary systems such as ERP, PLM or other data management systems. A complete programming interface automates and integrates components and assemblies. Load and position geometries. Compare or manipulate storage locations. Query the position and attitude of parts or forwarding of events to a guiding application. Intuitive handling is one of the basic principles of 3DViewStation. That’s why we designed the new UI along the lines of Office 2010, adding some intuitive ribbons. You need to be able to complete your tasks in a continuous flow, which is why we have ensured that the import interfaces with the various CAD systems function as quickly as possible. And now that 3DViewStation is available in a 64-bit version as well, all previous storage limits have gone out the window. Step on the gas pedal and utilize our internal data format whenever you need maximum performance! … look for an intuitive, easy to use application to load 3D CAD data quickly, and for options to measure, slice, and compare components and assemblies quickly and easily. We have done our best to ensure that your work with 3DViewStation is a real pleasure. Technology editors are always on the lookout for intuitive solutions to map and display products in various states. They need to hide or show parts, color parts, and create exploded views. Using the 3DViewStation you simply export the result as an image and integrate it into your work or assembly instruction. If you prefer communicating your data in 3D, then you will love the export capabilities of 3DViewStation to STEP or 3D PDF. 3DViewStation is a powerful 3D viewer for engineers and designers, designed for 3D viewing, 3D CAD analysis, technical documentation and 3D publishing. Users in the area of distribution & marketing, design, updating, operations scheduling, manufacturing, documentation, spare parts management, etc. 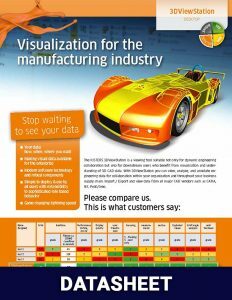 will be able to reliably, efficiently and economically handle their visualization and DMU processes. 3DViewStation is a high-performance 3D viewer supporting the file formats Catia V5, Catia V4, NX, CreoElements/Pro-Engineer, SolidWorks, Inventor, SolidEdge, Parasolid and neutral formats like STEP, 3D-PDF, and JT. 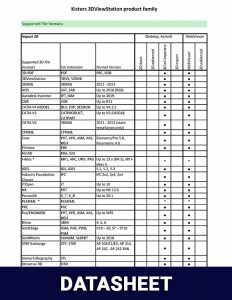 The system includes important analysis functions such as measurement, dimensioning, a 3D comparison function and true MultiCAD DMU, i.e. simultaneous loading and analysis of data from different CAD Systems, without conversion. The 3DViewStation AX is an ActiveX-component based on our 3DViewStation, designed specifically for the requirements of our customers. 3DViewStation on the one hand provides a native 3D-CAD-viewer as a system component, and on the other, a 3D viewer with all capabilities you will ever need for visual navigation. 3DViewStation WebViewer is a WebGL version based on our 3DViewStation technology. The 3DViewStation Web-Viewer is a high performance browser version CAD Viewer, which will allow you to access your 3D CAD data anytime and anywhere and with any WebGL-capable device from PC to smartphone. A WebGL-supported browser is all you need – no installation necessary. KISTERS Automation Server (KAS) is a very flexible and scalable server-based solution for the automated processing of 3D data, complex 2D and 3D documents, and automated drawing comparisons. 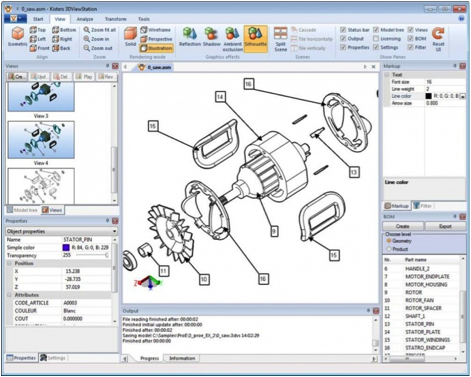 In addition to integrations of the KISTERS Automation Server in any leading systems, like PDM systems or SAP via a web service (SOA), KISTERS also offers a client for end users, which allows ad hoc use of many of the Kisters Automation Server functions, including conversions of native CAD assemblies into 3D PDF, or the comparison of 2 versions of a drawing. The end user client uses the same server and ensures that enterprise guidelines regarding standardized document creation are complied with.